*NBC’s “Law & Order: Special Victim Unit” has been known to base their episodes on current events. Earlier this year they had one inspired by Chris Brown and Rihanna’s highly publicized 2009 domestic dispute, and now it will highlight Trayvon Martin’s story. The NY Daily News reports actors Jeffrey Tambor and Cybill Shepherd (pictured above) were seen in New York City on Tuesday filming a scene from an upcoming episode of “Law & Order: SVU” inspired by Martin’s case. Shepherd plays a George Zimmerman-like vigilante character who has apparently killed a black teen named Mehcad. Tambor is cast as her lawyer. The scene shows Shepherd, Tambor and the legal being mobbed my by reporters and angry protestors with signs, much like those seen in rallies held in Martin’s honor last year, as they exit the court. 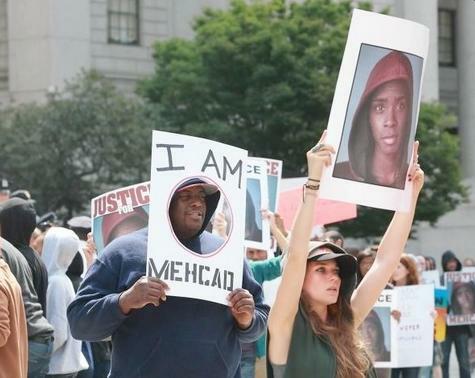 Martin’s death sparked national attention from various organizations who have responded with rallies, magazine covers, and ads in honor of the slain teenager. Most recently the Coalition to Stop Gun Violence released an online video ad, reenacting the night Travyon Martin was killed in an effort to stop “Stand Your Ground” laws nationwide. The Trayvon Martin inspired “Law & Order: Special Victims Unit”episode is scheduled to air in October. Law & Order’s ratings are probably falling and have no choice but to get on the band wagon…. Hollywood does not seem to get the importance of these issues. To combine the episodes is a slight. We all deserve better than these lame attempts to get out views because of hot button topics. Trayvon’s image has become immortal. We should all wear it and burn it into the psyche of this society. Let this child be the last one taken. The world deserves better and so does he.